Colorful Hammam towels are adorable coverups for the beach. I’m actually thinking about getting a few stripe versions to use as a tableclothes. 100 % cotton the towels are typical in Turkey. Super lightweight and great for traveling. Amazing color and pattern for just $55 each. Check out more at scentsandfeel.com. the great thing is, they absorb the water really fast and they dry even faster :) but branded versions are a little too expensive. you could get 2 for $5 in a local market, but it's getting harder to find %100 cotton ones nowadays. I Love these hamman towels, I picked some up for super cheap when I was in Istanbul last summer! Oh, they're beautiful! I may have to buy a few to give as gifts to special people. These are great! I can seriously see myself getting on for summer at the beach! Thanks for sharing. 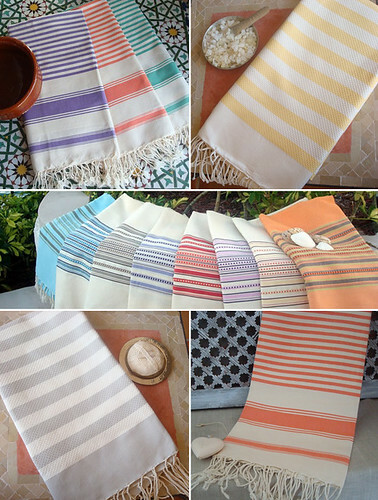 I love hammam towels because they're so versatile. The price on these are great – thanks for sharing the link.